Item # 296625 Stash Points: 1,395 (?) This is the number of points you get in The Zumiez Stash for purchasing this item. Stash points are redeemable for exclusive rewards only available to Zumiez Stash members. To redeem your points check out the rewards catalog on thestash.zumiez.com. 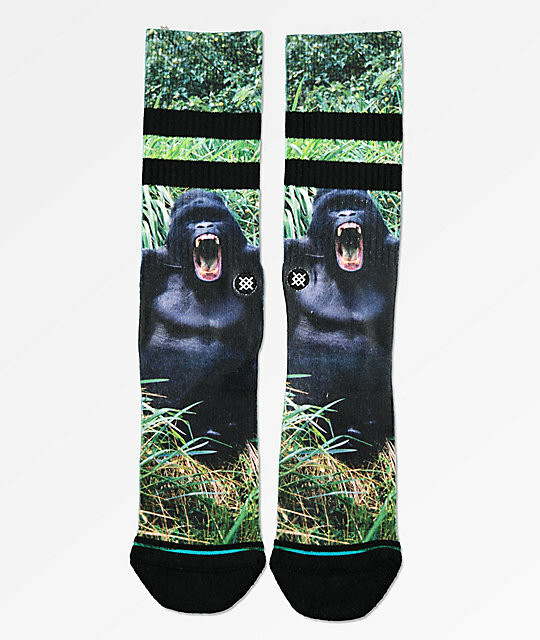 Get wild in the Gorilla Black Crew Socks Stance! Made with Stance's classic medium cushion design, these athletic tube socks are featured with gorilla graphics printed throughout. Complete with a soft poly blend construction with reinforced heels and toes, these crew socks are perfect for accessorizing your look. Gorilla Black Crew Socks Stance. Fits Men's US shoe sizes: 9-12. Athletic ribbed cuffs for secure fit. Stance signature logo embroidered on ankle. Classic medium cushion design with poly blend construction. 82% polyester, 16% combed cotton, 2% elastane. Machine wash, keep out of dryer for extended life.